The real lives of circus elephants are grim, as one big top audience recently found out. 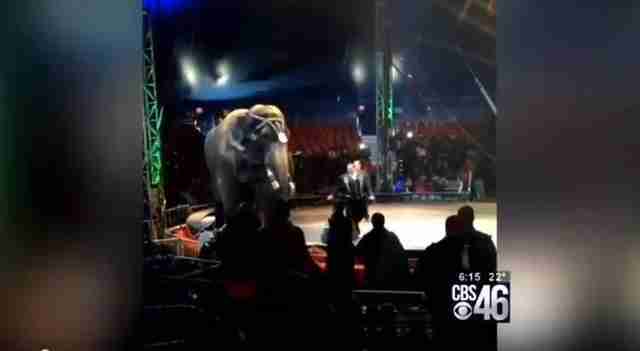 An elephant trainer at the Atlanta-based UniverSoul Circus is being charged with animal cruelty after he allegedly pulled an elephant off the stage by sticking a sharp metal baton called a bullhook in his mouth, local station CBS46 reported. The Asian male elephant, named Beau, had refused to leave the ring during a show on Feb. 14. According to PETA, a young calf was released to help usher him off stage, and the bullhook was pulled out as well. 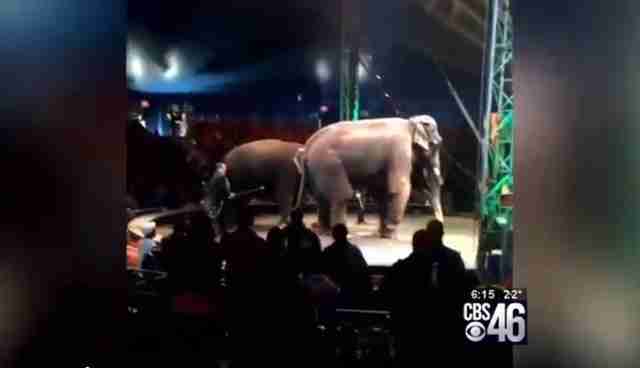 After a tip from a Fulton County animal control officer, the handler and the circus were charged. Atlanta's CBS46 news obtained footage taken by an audience member that allegedly shows the elephant refusing to leave the ring. In 2012, the Atlanta City Council voted on a measure to ban the use of bullhooks, but the ordinance was watered down before it was passed. Now, bullhooks are illegal when used on elephants in Atlanta only when it can be proved "beyond a reasonable doubt that they were used in a specific instance to 'discipline' an elephant and that the elephant's skin was broken, scarred, or otherwise damaged as a result," according to PETA. However, the ordinance does ban trainers from inserting a bullhook into an elephant's orifice - exactly what UniverSoul is being accused of. UniverSoul Circus views with grave concern any suggestion that the animals associated with its shows receive anything less than absolutely first-class care and treatment...one of the two was not even present at the time the alleged abuse was supposed to have occurred. The UniverSoul Circus has a poor track record for animal welfare. Its exhibitors have received dozens of citations from the U.S. Department of Agriculture. These include failing to provide adequate veterinary care for a sick elephant, exposing caged animals to toxic cleaning agents and dozens of other animal welfare issues. See this page for more information on how to prevent circuses from keeping elephants.